When a trade show is packed, there can be a raucous and vibrant energy to the whole affair, as businesses clamor to get the attention of passersby. While such chaos can seem overwhelming, especially for small businesses who are trying to eke out some clientele in the face of national corporations, it is often better than the alternative. The golf industry recently underwent its own dip in trade show turnout along with the recession, according to The New York Times, and has since risen back to a healthy attendance. Other industries may have undergone similar situations, but it’s a situation that all likely hope to avoid. 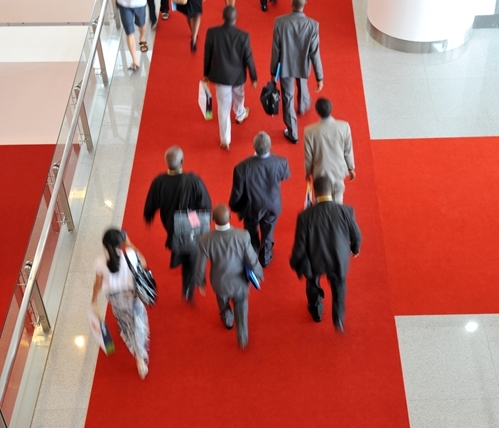 Lackluster trade shows are nonetheless opportunities to interact with potential clients. Organizations that want to have a successful show should still work hard to make themselves stand out to customers the best they can with engaging booths, thoughtful promotional items and good sales practices, even if their competitors are noticeably lacking. Additionally, they should make the effort to try to drum up attendance at future trade shows through mass marketing. In some sense, the tale of the golf’s largest annual trade show is storybook. As The NY Times tells it, six salesmen lined up products on a practice green during 1954’s P.G.A. Senior Championship in Dunedin, Fla., aiming to catch the attention of pros at the big event. The following year, they moved from the green to the P.G.A. National Golf Club parking lot, as did the pros checking out products. Eventually it became the yearly advent of the sport. The show grew over the decades to feature musical acts, celebrities, golf outings and intense double-decker booths, at one point featuring 1,539 companies in 2001 at a 712,625-square-foot exhibit. That is, until the national economy hit troubles, the industry suffered and some major companies started pulling out. Yet, the industry rebounded with the economy, as well as with new strategies that better appealed to consumer interests, according to the news source, focusing not just on sales but also on ways to kick off the P.G.A. Cautious buyers are probably the last thing that companies want at their trade shows, but even if an industry isn’t in a slump, the Internet has already made many consumers wary, given that they can simply scope out competitors on their smartphones. No matter the situation, companies should be trying to put their best foot forward at their trade shows. If busy, then they need to rise above the din. If a trade show is sparse, a booth still needs to bring in the energy that may be generally lacking from the event. Some common advice is investing in a great booth that is eye-catching and engaging. Business 2 Community has noted, though, that the booth should do more than bring in customers, but also make them feel welcome to stay – a sort of respite from whatever lay outside the booth. Should you find a trade show be under-attended, then businesses can make use of the extra space by creating room to walk around displays and to tastefully present promo items as well as products. If businesses are worried that turnout for future shows will be deficient, then they may also want to start advertising for the event. As the Minnesota Society of Certified Public Accountants recommended, advertising in advance will announce companies’ presence at a trade show, and hopefully bring about more potential consumers.